1 Put the purple sweet potatoes into hot water and it bring to a boil. Then turn it down to a medium heat. 2 In a hot wok or large saucepan put the olive oil, then in the onions, red pepper, green pepper and garlic on a medium heat and mix. 3 Then add the carrots, black pepper, chilli flakes, dried thyme and mix then leave for 2 minutes. 4 Then add the water and place the lid on for five minutes. 5 Add the spinach and kale and then place the lid on for 5 minutes or until wilted. 6 Add tomatoes in mix and put the lid back on for 2 minutes. 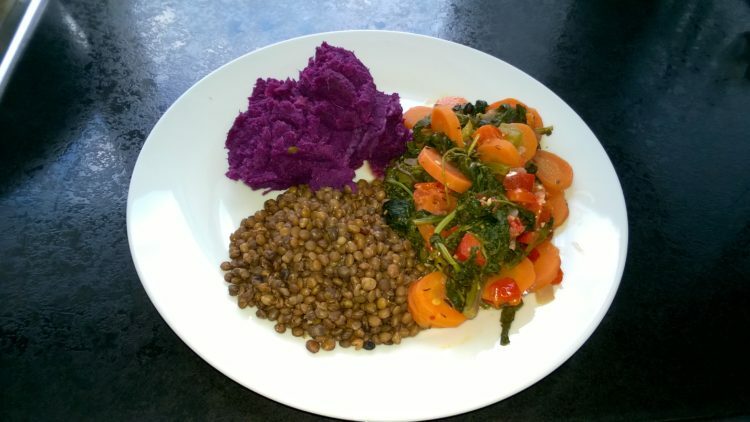 7 When the purple sweet potatoes are cooked drain and mash. 8 Put the organic green lentils in a microwaveable bowl with a pinch of black pepper and heat according to the instructions on the can. 9 Mix the carrots and kale, then plate up.